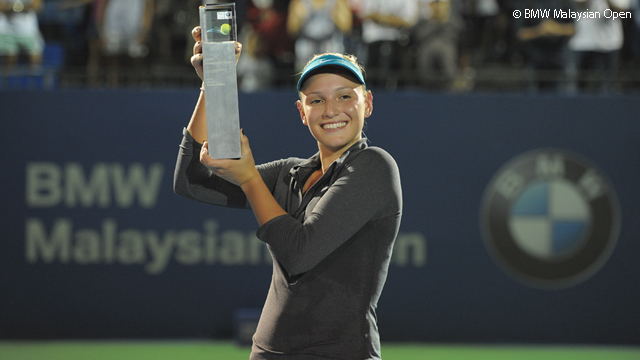 WTA rising star Donna Vekic not only won her first WTA title, she also became the first player under 18 to win a WTA title since 2006! Just like she had alluded to a day before, it was third time lucky for WTA rising star Donna Vekic at the BMW Malaysian Open on Sunday night, as she won her very first WTA title. And the icing on the cake? She scored her first Top 10 win over Dominika Cibulkova to do it. Vekic, a runner-up in her first two WTA finals at Tashkent in 2012 and Birmingham in 2013, looked like she was on the verge of going 0-3 as she was a handful of points from losing this one, trailing 75 54. But Vekic came alive from there, reeling off seven games in a row to take that second set, 7-5, and build a 4-0 lead in the third. Things got very dramatic from there – she missed out on three match points at 5-2 and Cibulkova stormed back to push it to a tie-break, but the No.7-seeded Croat held her nerve and with one last forehand winner she finally put the No.1-seeded Slovak away, 57 75 76(4). That last forehand winner made all the difference – Vekic won just one more point than Cibulkova in the two-hour, 51-minute epic, 122 to 121. Vekic also out-aced Cibulkova during the match, 11 to 2. In the end, Vekic’s win over the World No.10 was her first Top 10 win – her first Top 20 win, as well – and she won her first WTA title. At 17 years, 10 months and 23 days, she is the first player under 18 to win a WTA title since Vania King won Bangkok in 2006 aged 17 years, 8 months and 12 days. After winning her semifinal, Vekic said she was hoping for third time lucky in her third WTA final. She had a much different tone in her on-court interview after the final. “I’m so happy – I don’t know what to say, I’m so, so happy!” Vekic beamed. Cibulkova, who came into the final with a WTA-leading 24 match wins on the year, falls to 4-7 in WTA finals. It was her third WTA final of the year, after the Australian Open (where she fell to Li Na in her first career Grand Slam final) and Acapulco (where she defeated Christina McHale for the title). “She played really well today,” a gracious Cibulkova said. “In the second set I was really close to winning, but she played really well, really strong, and it was just about a few balls out there, really.